In small bowl, mix ranch dressing and avocado. Spread 1 side of each bread slice with butter. 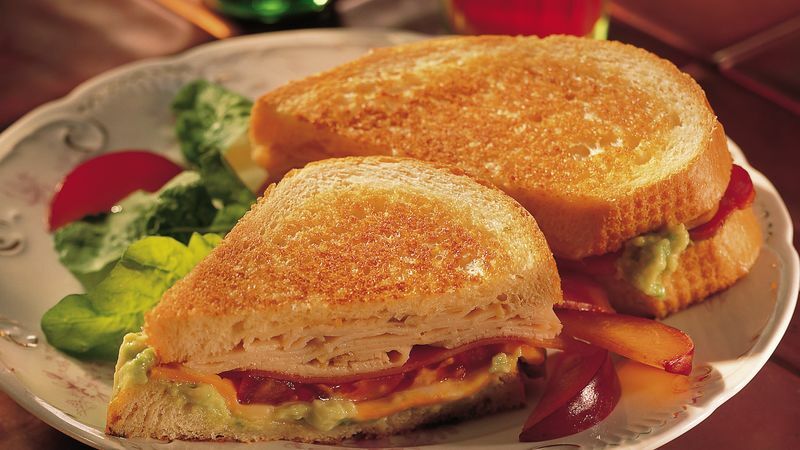 On work surface, place 6 bread slices butter sides down; top with turkey, bacon, tomato, cheese and dressing mixture. Top with remaining bread slices, butter sides up. In 12-inch skillet, place sandwiches. Cover and cook over medium heat 4 to 5 minutes, turning once, until bread is crisp and cheese is melted. Try this. Turkey bacon has the same smoky flavor as pork bacon, but it has much less fat. One slice of regular bacon weighs in at about 6 grams of fat per slice. And turkey bacon? It weighs in at about 0.5 gram of fat per slice.